"The Trade of the Decade"
A Round of Applause for Exxon and Chevron! 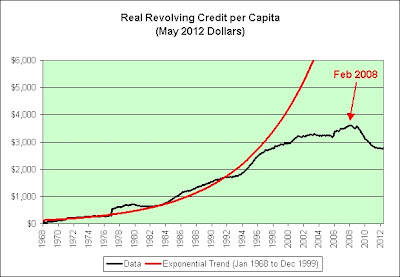 Peak Real Revolving Credit per Capita? I continue to climb at least 20 extra flights of stairs each day. I've been tending to do the stairs 5 flights at a time using the stairway in my front hallway. It takes me well less than a minute to do each set. I just run them. This makes them perfect for commercial breaks on the television. Two birds, one stone. It also gets my heart rate up significantly at least 4 times per day. Three birds? It's been a good month. I wouldn't read too much into these last two days. 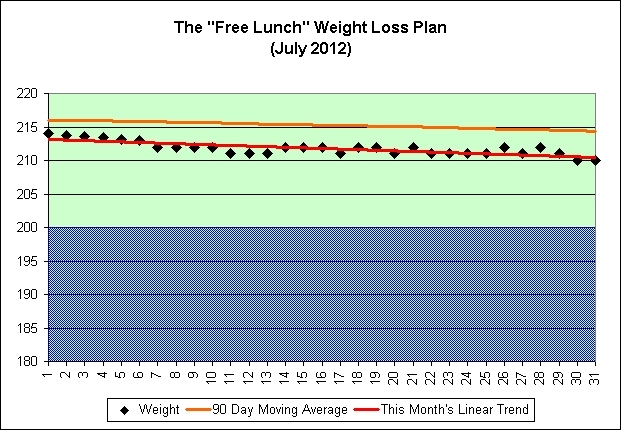 I was not making a huge push to improve the charts (nor would I consciously). In sharp contrast, I ate something that didn't agree with me and paid the price. What can I say? Life happens. I originally estimated that I was gaining about 3 pounds per year. 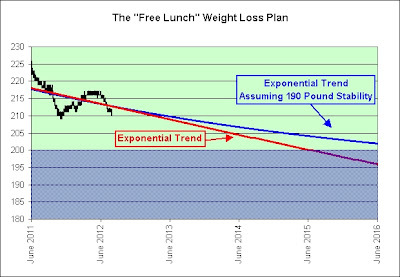 I figured that if I burned an extra 10 pounds per year then it would take me 3-4 years to get back down to a healthy weight. 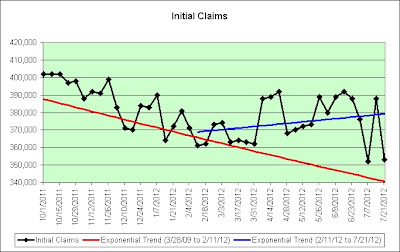 Although the data is very noisy, I appear to be on track. I am 8 pounds lighter than I was one year ago today. Is it the pure math of the extra calories I'm expending? Is it being conscious of my weight each and every day? 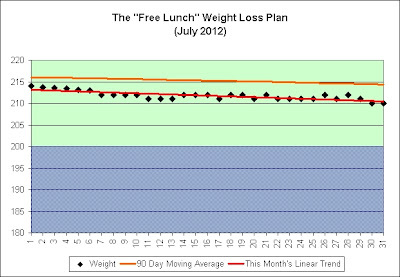 Is it posting these charts for others to see (subconscious peer pressure)? Do I really care? It's working and there has been absolutely no hunger involved. That's all that matters. A trivial change in my behavior is apparently all it takes over the long-term. 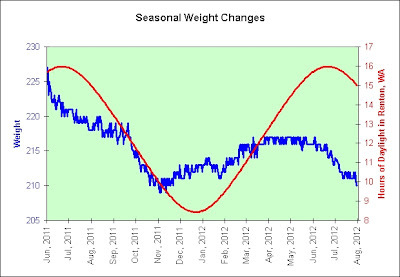 As seen in the chart above, I definitely seem to be swayed by the sun. It's not a perfect match. 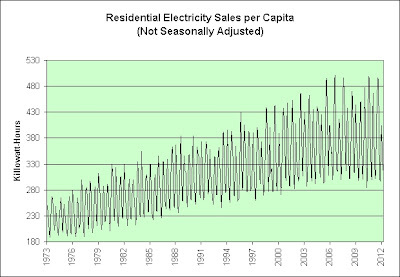 One reason for the discrepancy may be that the month of maximum daylight is not the month of maximum heat. There's a lag. There's also probably a lag between my mood and the seasons. Fall may be my favorite season. Halloween is a fun holiday. Knowing that yard work season is finally over can't hurt either. Unfortunately, the end of yard work means that I don't burn as many calories doing yard work (or hiking or doing a variety of other outdoor activities). Combine that with leftover Halloween candy and what do you have? The chart! If it happens again, then I'll make it up next year. No big deal. This is a long-term plan. That said, there's a chance the effect won't be as big this year. Will my behavior subconsciously change now that I've seen the effect? Who knows! Perhaps I'll alter my plan in the future (once I am in the blue zone in the first two charts) to adjust for these seasonal effects. More stairs in the winter and less in the summer? I'm in no hurry though. It is such a low priority to me. First things first. And lastly, the weather is not the only thing that affects my mood and/or stress level. I'm not a moody person, but I am easily stressed. That's especially true when I think about our country's long-term economic future. I'm doing that each and every day too. Sigh. I've been thinking about this chart and it dawned on me that I had seen this shape before. I now offer a new chart for you to ponder. 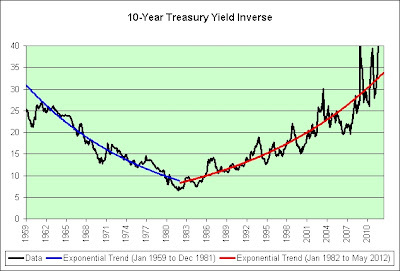 The line in red is the inverse of the 10-year treasury yield. If this relationship has any merit, then as interest rates approach zero corporate profits divided by wages approach infinity. There are two ways this can happen of course. 1. Corporate profits can go higher. 2. 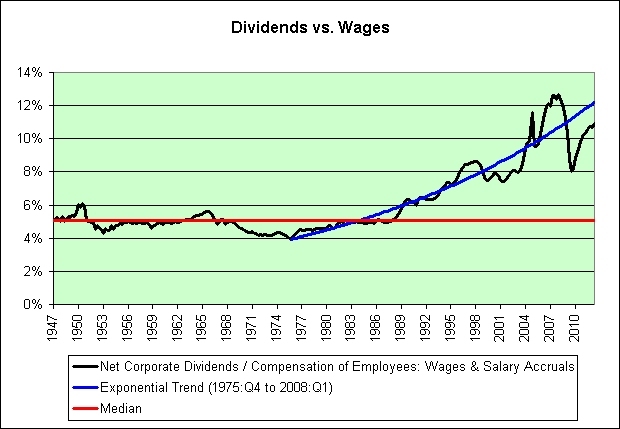 Wages can go lower. The former is great for the 1%. The latter is not so great for the 99%. 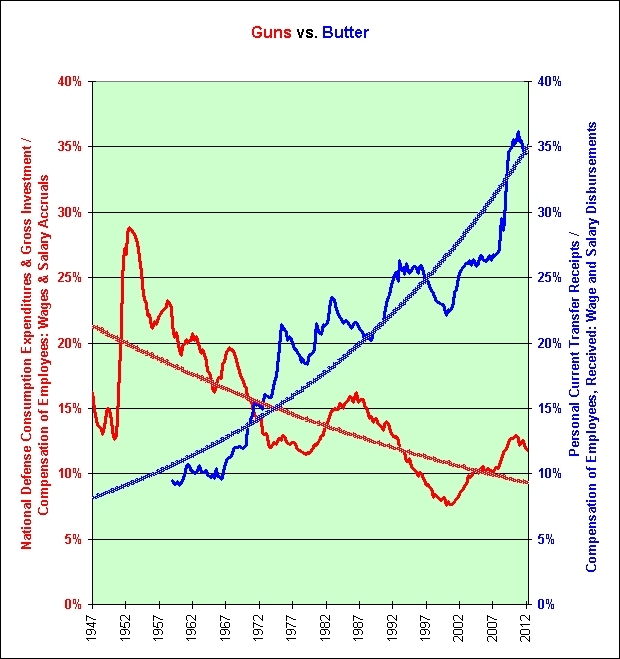 I would like to remind everyone that correlation does not prove causation. 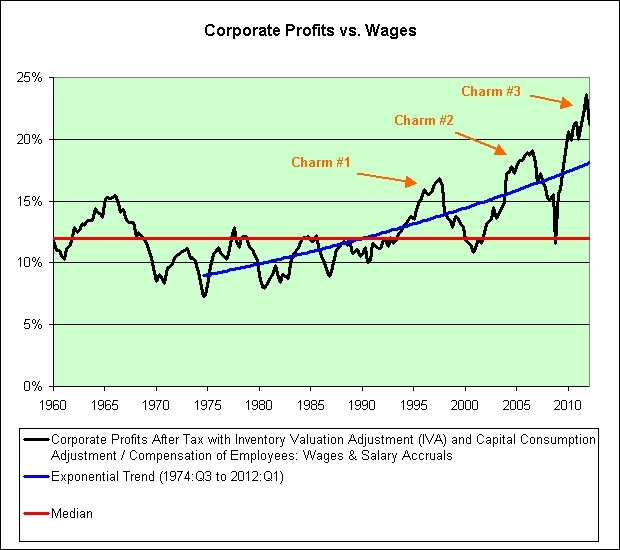 I think a case could easily be made that interest rates are falling because wages are struggling compared to corporate profits. I might even be so bold as to make such an argument. This post inspired by Troy from the comments of my last post. It's over, man. Let her go. 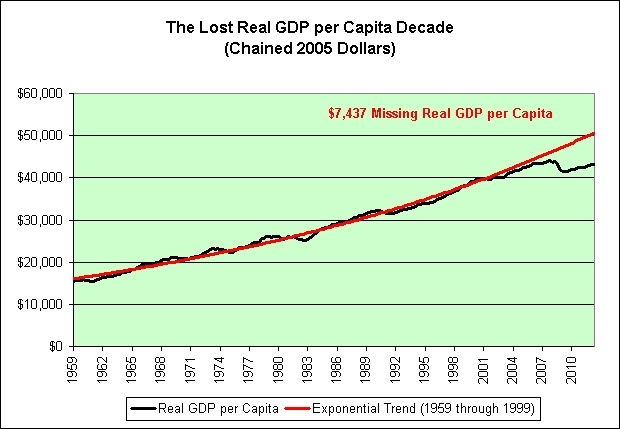 The chart shows the average real GDP growth per capita over the previous decade. Please forgive me for not jumping up and down in delight at today's "new normal" real GDP per capita growth. The annualized real GDP growth came in at 1.5% in Q2. 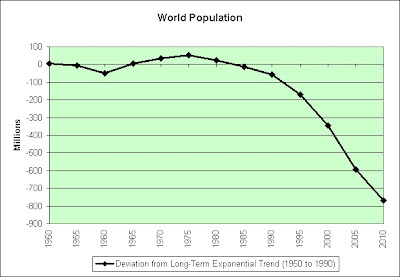 Once you adjust for population growth, there's not a whole lot left. 1. Our standard of living has been stagnating for more than a decade. 2. Old Normal -> Normal -> New Normal -> New New Normal? 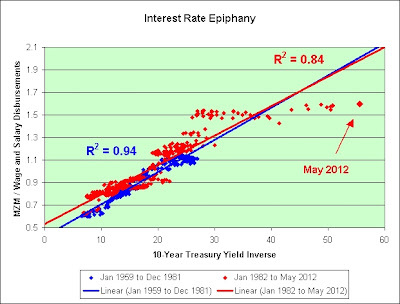 The anticipation of the next normal probably helps explain why the 30-year TIPS yields just 0.41%. 30 years is a long time. Things happen. 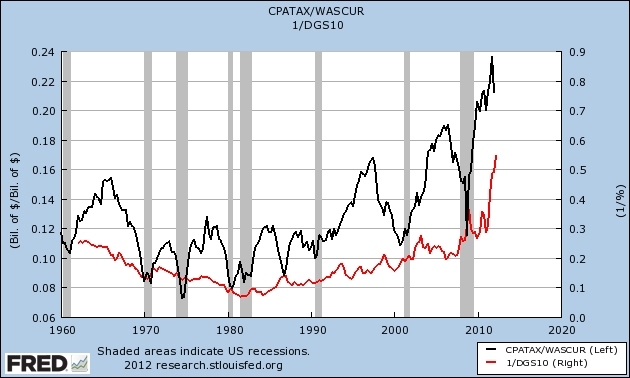 The following chart shows defense spending as a percentage of wages and personal current transfer receipts as a percentage of wages. 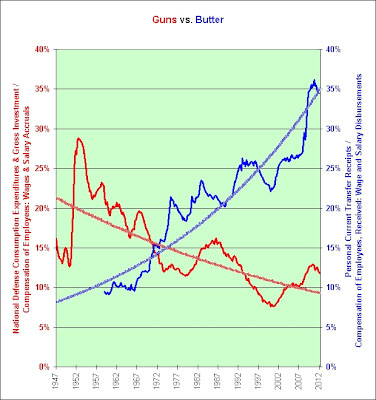 Although guns are well above the long-term exponential decay trend, butter is the clear winner here. 100% butter by 2060! Or bust! Hey, it's just a t-shirt idea. 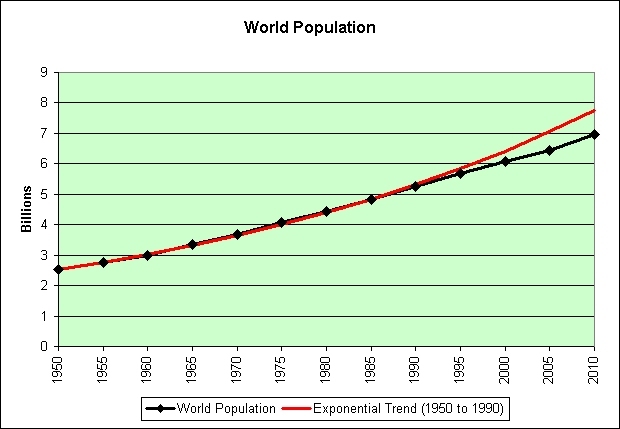 We'll hit 100% butter in 2059 if the exponential trend miraculously continues. 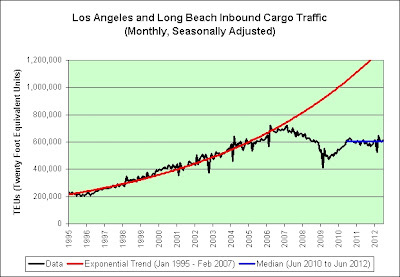 These exponential trends do have a way of eventually failing though. Go figure. 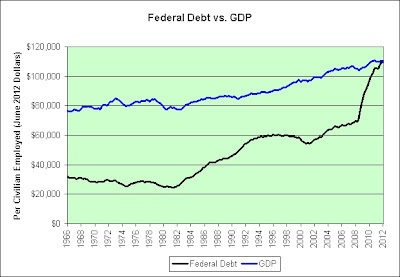 This post inspired by US defense spending since end of WW II at Wasatch Economics. It's red vs. blue. 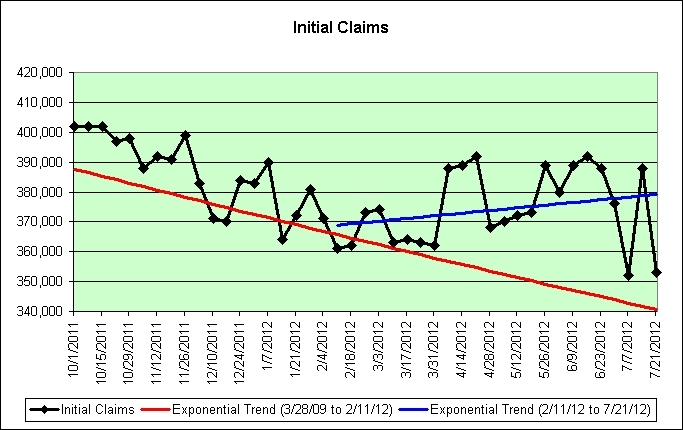 Blue had the upper hand for a few months but the red trend line is definitely showing some resilience. As the match progresses, Creed's superior skill is countered by Rocky's apparently unlimited ability to absorb punishment, and his dogged refusal to be knocked out. All we need to do is get back on trend. The gory details are left for those who sit in ivory towers to figure out. 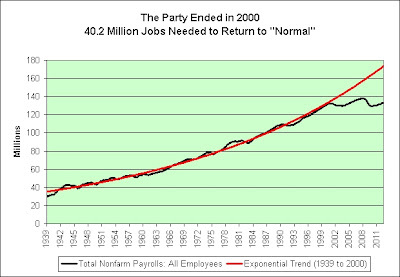 How does one create 40.2 million jobs with just 12.7 million unemployed? I am not a miracle worker! Two centuries! That's what I'm talking about too. First we get employment back on track. 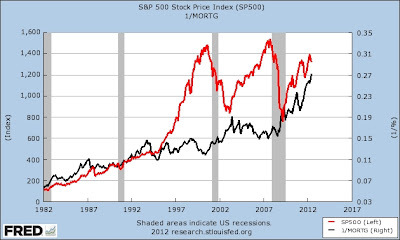 Once that is done, the stock market will surely follow. If little job growth since 2000 has given us little stock growth since 2000, then just imagine what 10 billion jobs will do. Well, with my plan you won't need to imagine. 7,400%! 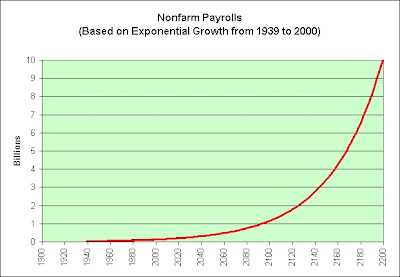 That's how much growth we should see in nonfarm payrolls by the year 2200. How hard can it be? Simply UNFAIL the trend! Mwuhahaha! This is a reminder to the powers that be. 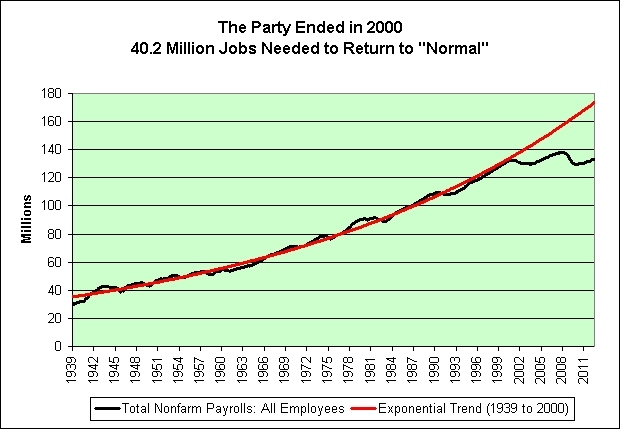 We'll need 10 billion permanent jobs that can't be easily automated and/or outsourced away. The year will be 2200 and there will be a temptation to do just that. Purveyors of this pessimism stress that the future rate of economic growth in developed countries looks bleak. 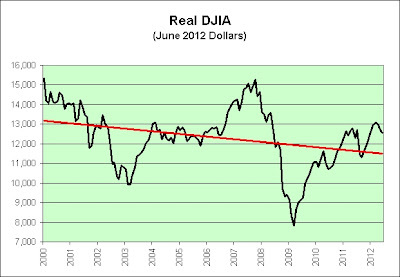 On the contrary, I believe that the long-term outlook is bright. As seen in the chart, the interest rate on the 10-year TIPS has fallen nearly 2% since Jeremy Siegel warned us that real yields would go higher. 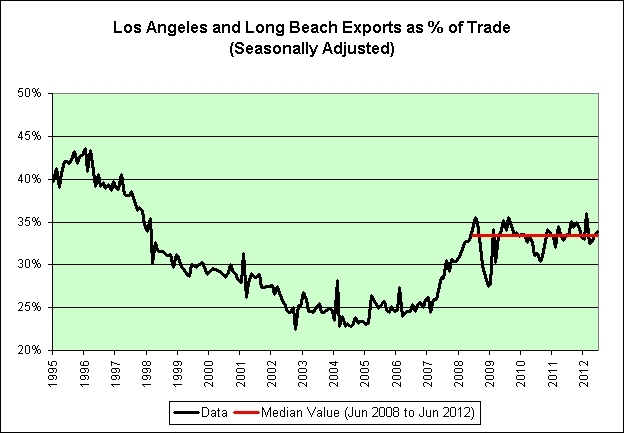 This leads me to conclude that risk abounds in believing that the long-term outlook is bright. 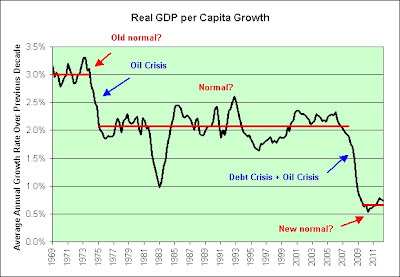 Mish: UK GDP Disaster Far Worse Than It Looks; UK Growth in 2012 "inconceivable"
Presented that way, UK GDP does look like a disaster. Would it have been pessimistic to argue that the future rate of economic growth in the UK looked bleak? Or would that have been considered realism? While the phrase is usually understood as an expression of shock towards Brutus' betrayal, it has recently been argued that, if they were uttered by Caesar, the phrase is thought to instead be intended as a curse and threat. 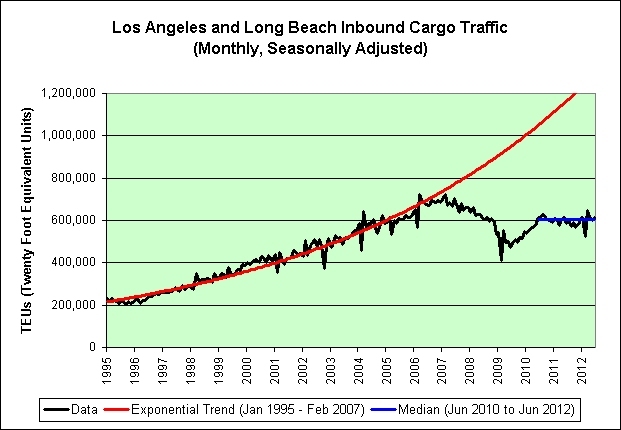 So many exponential trend failures, so little time. The red line shows the S&P 500 (left scale). The black line shows the inverse of the 30-year conventional mortgage rate (right scale). If things do not change the way you want them to, you must adjust to the way they are. Sometimes they carry blocks the size of houses as well just to add to their destructive power, and really there is nothing you can do to mitigate their impact. One wonders if Doug Kass gets his trading tips from the Wall Street Journal. 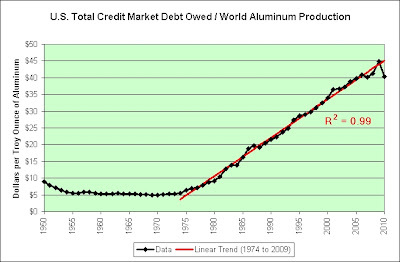 I am referring specifically to "The Great American Bond Bubble" written two months earlier by Jeremy Siegel and Jeremy Schwartz (as also seen in the following link). I'm not quite done with Mr. Kass. 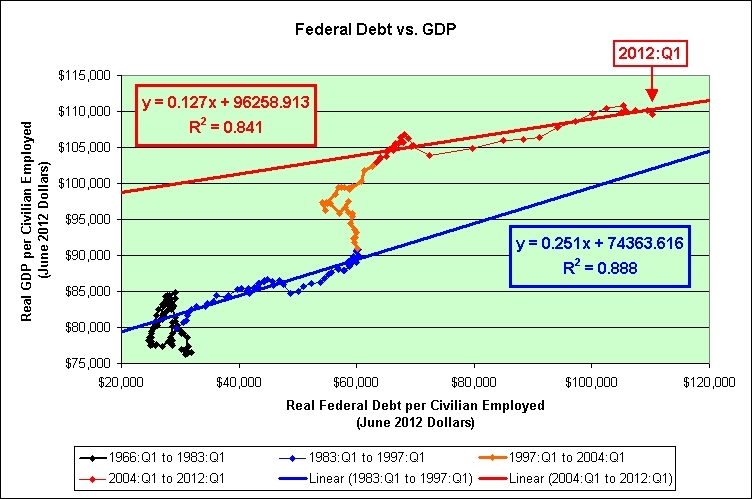 As of June 18th, we've been on white swan watch here at the Illusion of Prosperity. I don't mean to be alarmist but the white swans were last seen behind the woodshed. 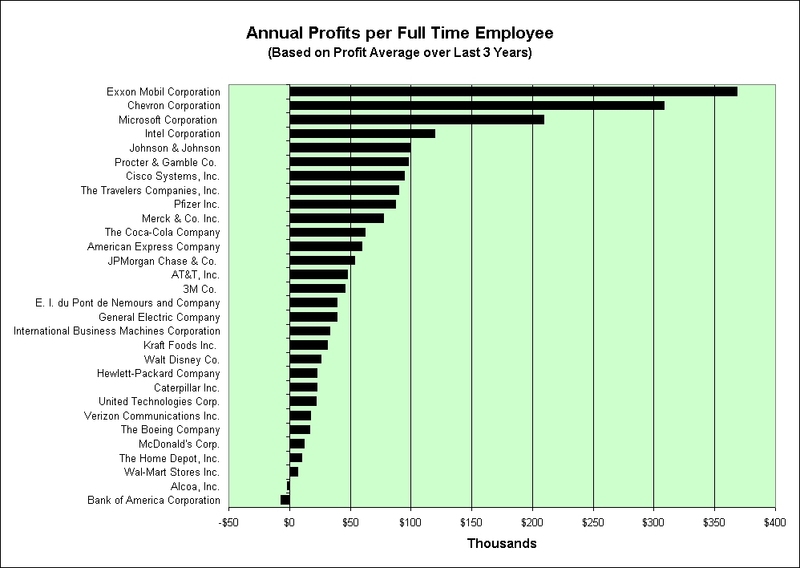 I'm taking the average annual "Net Income Applicable To Common Shares" for all 30 companies in the Dow Jones Industrial Average over the previous 3 years and dividing it by the number of full-time employees as reported by Yahoo Finance. Way to go Exxon and Chevron! You win! Last week I asked, "Is this a return to the former trend? Or is it a one-time anomalous event?" 1. 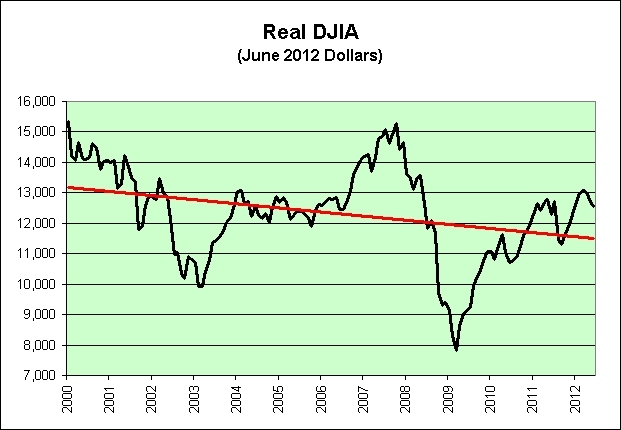 We did not return to the former red trend line. 2. We did return to the new blue trend line. 3. The theory that this was a one-time anomalous event seems reasonable to me. 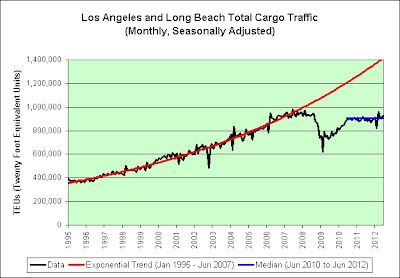 Let's put that same data on a scatter chart and throw in some trend lines. 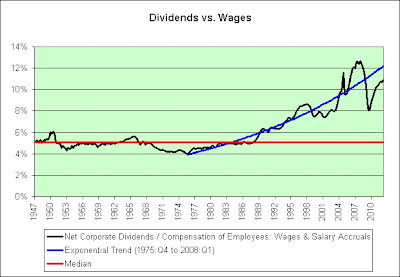 Note that the slope of the red trend line is only half as steep as the "more prosperous" blue trend line. The bad news doesn't end there. 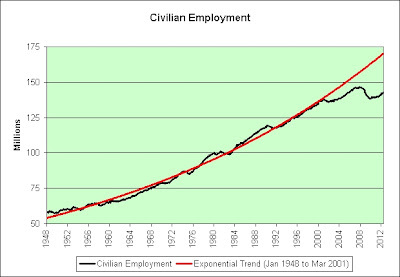 Note the exponential trend failure in civilian employment. 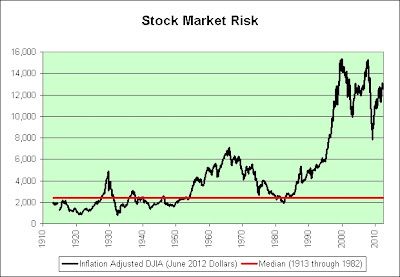 I would bet all that I own that we will NEVER return to that red trend line. I'd even offer you 100-1 odds to boost your potential return. Leverage up! 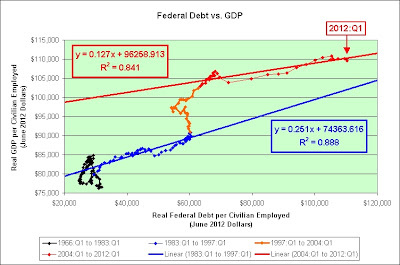 In summary, it is taking increasing levels of federal debt per civilian employed to get the same level of GDP growth per civilian employed. 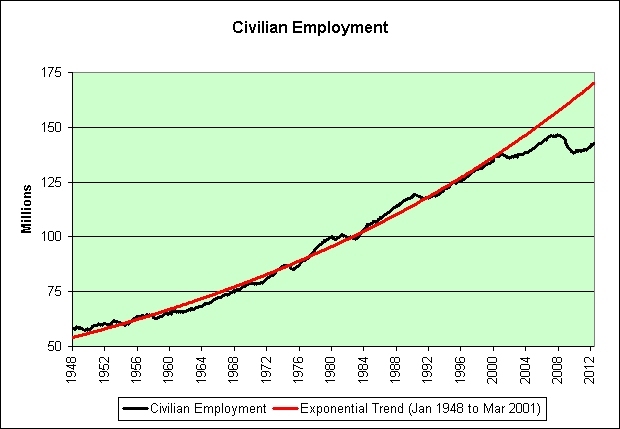 Meanwhile, civilian employment is not growing like it once was. Not even close. For those who believe that the US doesn't share these problems, I have some exceptional ocean front property in Kansas I would like to sell. As you can see, the data is extremely noisy. 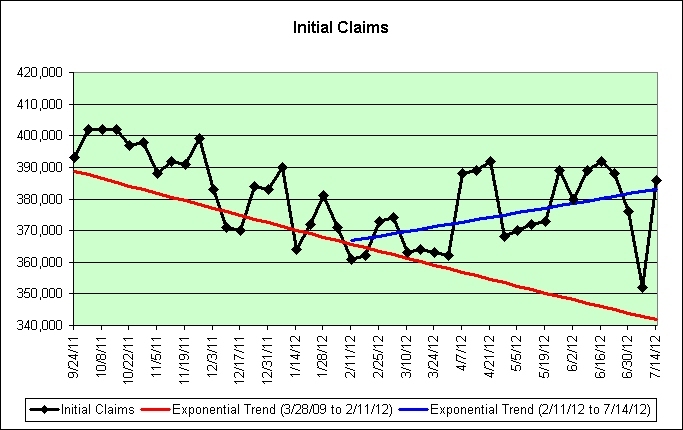 That prompted me to use the Census seasonal adjustment program to get a better look. 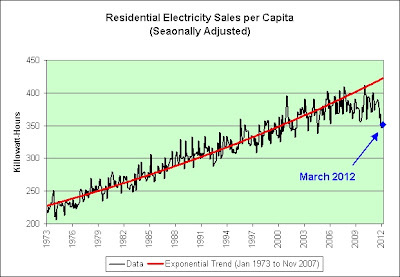 Another exponential trend failure? How unexpected! 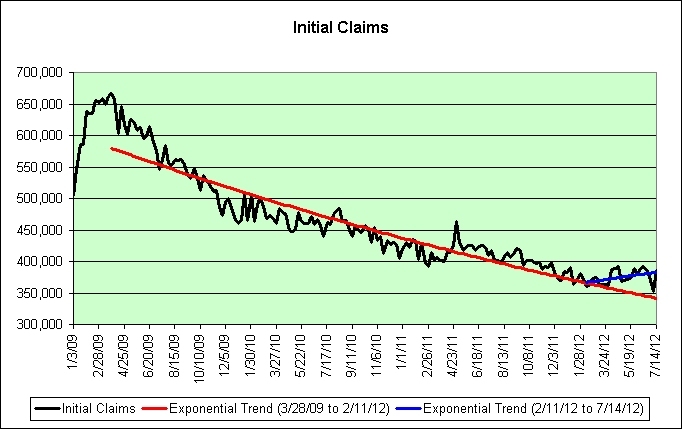 As of March, could we be any further from the long-term trend line? Probably not! 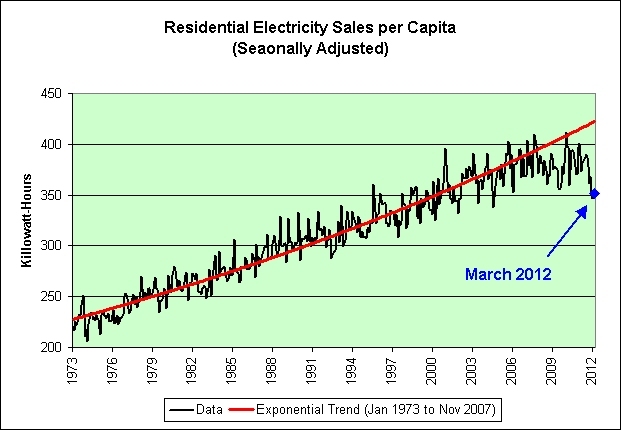 Is the soaring price of electricity dampening demand? Not exactly! 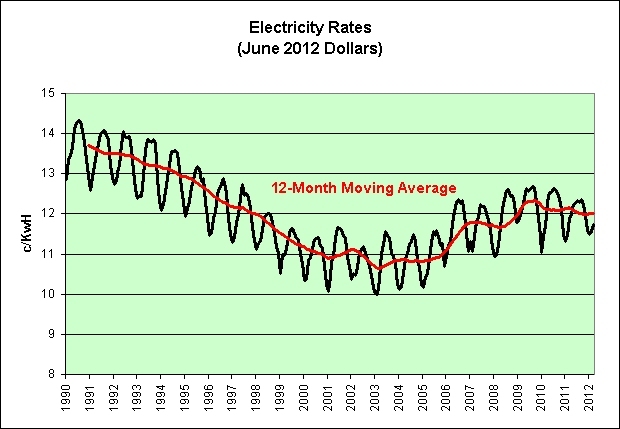 For all intents and purposes, electricity is cheaper now than it was through most of the "prosperous" 1990s. So what might this mean? 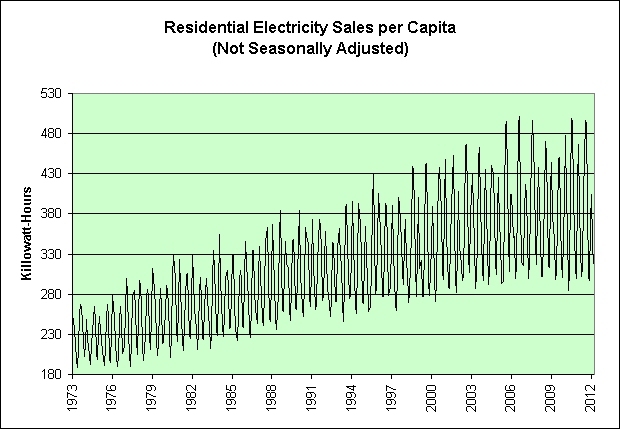 If recent residential electricity demand is any indicator, it might be best to brace for economic impact again. Frugality is in season. A PriceGrabber survey in June had showed that nearly half of consumers expected to spend more this back-to-school season than in 2011 and that nearly 80 percent planned to buy online. 1. Nearly half? That's a reason for optimism? Seriously? 2. 80% plan to buy online? The malls better discount heavily! For what it is worth, I've got a really bad feeling about this upcoming Christmas season. "Every year we see holiday shoppers getting a jump-start earlier and earlier," said Jackie Warrick, president and chief savings officer at CouponCabin.com. "For many families, planning ahead for holiday shopping is the best option, as it gives them plenty of time to buy gifts and to find the lowest prices possible." Brewing Issue: What Beer Should the President Drink? Let's assume for the moment that hard-hitting investigative journalism is not dead and that this truly is the most pressing issue of our time. If that is indeed the case, then I would suggest skipping beer entirely and heading straight to the liquor cabinet. "Everything will be wonderful someday"
I think the ride may be over. 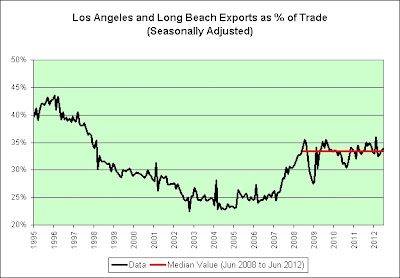 As of 2010, we were roughly 10% below the trend line (0.99 correlation notwithstanding). That's 10,500 square feet of aluminum foil. I shouldn't need to buy any more in my lifetime more than likely. This is not a hyperinflation story to me. 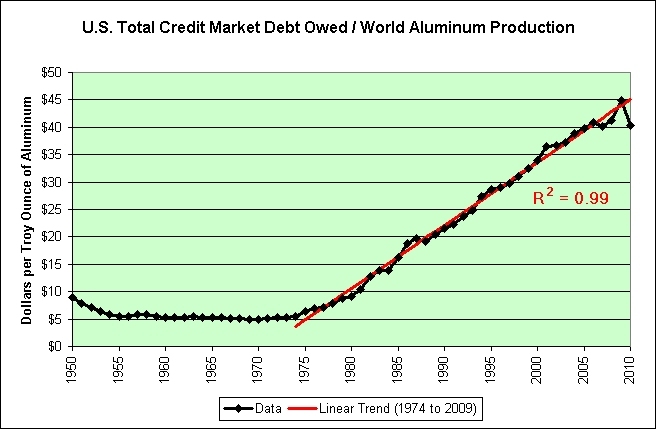 I just think the aluminum will probably treat me better than 0.1% treasury bills held long-term. As an added bonus, I won't have to pay tax on any inflationary gains. Ben Bernanke wanted me to buy stuff. I did. How it helps our long-term economy is beyond me. 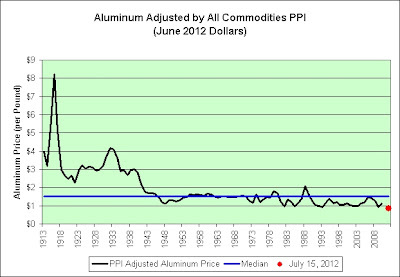 And lastly, if we ever move to an aluminum standard then I'm going to be set for life! I say this somewhat tongue in cheek of course. "However hard you look, there's just no good news in this report," said Paul Ashworth, chief U.S. economist at Capital Economics. I bring it up because I was out doing yard work yesterday. I heard the sounds of an ice cream truck approaching and it made me smile. Imagine my disappointment when a generic minivan with stickers arrived. I don't claim to be an ice cream truck expert, but here's a thought. Be a bit creative. If that truck had come down my street then even I would find it hard to resist an overpriced ice cream treat. Surely we won't hyperinflate without their help. 1. There is no gold standard. 2. There is no way to protect savings. 3. There is no safe store of value. 4. There is no way for the owners of wealth to protect themselves. 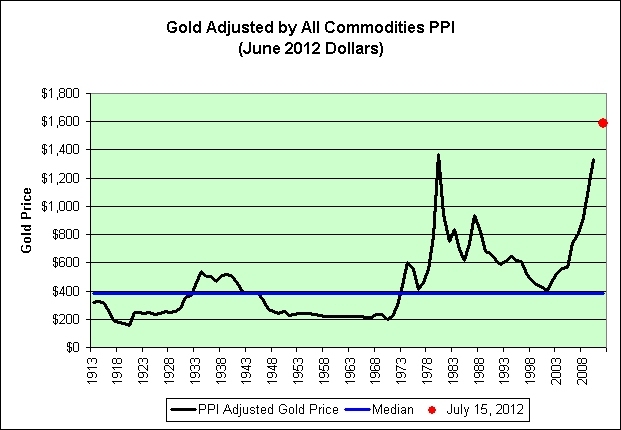 This is just an opinion of course, but it is my belief that at these prices gold is a risky store of value. 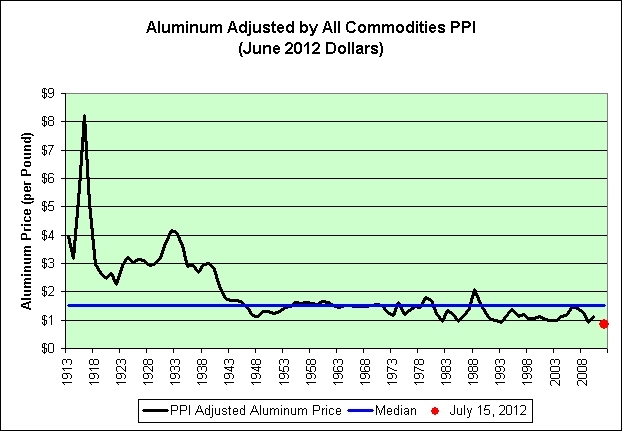 It is roughly 4x its median price over the last 100 years when compared to other commodities in general (as seen in the PPI: All Commodities index). Surely there has to be a safer inflation hedge than gold at this point. If you truly believe we are going to hyperinflate and you also believe that global wages will be under pressure, then the typical commodity has to do the lion's share of the inflationary work. Right? 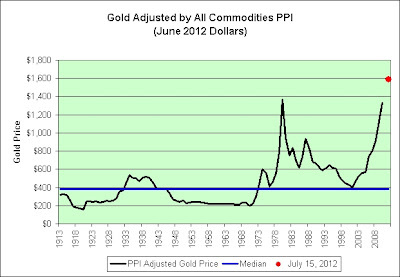 As seen in the chart, the typical exported commodity is very cheap compared to exported gold. 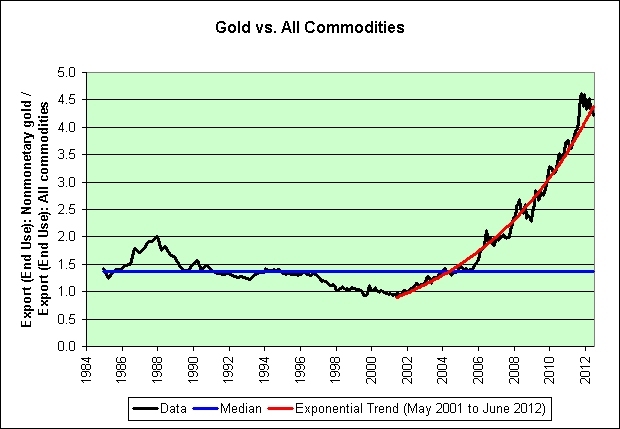 On the one hand, I see nothing in this chart to suggest that gold's bull run is over. 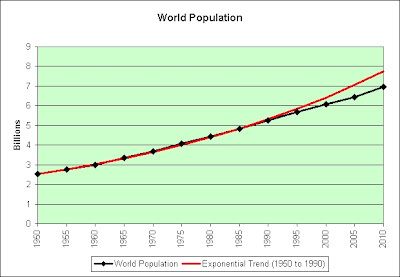 On the other hand, I believe that when this exponential trend does end it is going to fail spectacularly. 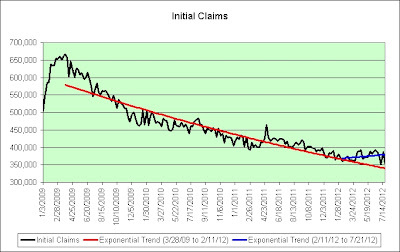 That trend line in red is increasing at a fairly consistent 15.5% annual pace and has been doing so for 11 years. Self-fulfilling prophecy? How is this any different from the "sure thing" Nasdaq bubble and the "sure thing" housing bubble? What can I say? I am a gold heretic. Gold treated me very well from 2004 to 2006. I've since lost the faith. Gold does not interest me at anywhere near these prices. I would also point out that these opinions are not based on what the dollar does or does not do. 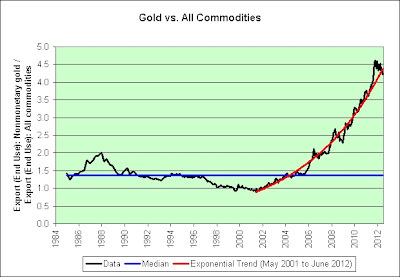 I'm simply comparing gold to every other commodity. I stress that these are just opinions. This is not investment advice. I can only price gold for myself. I wear no jewelry. Jewelry clearly has less value to me than it has to others. In general, I don't like to be dependent upon what others think my investments are worth. When it comes to gold, that's about the only way I can value it though. If I was the last person on earth, then gold would have very little value to me. That's not true of other commodities. I can certainly tell you what a glass of water would be worth to me if I had just crossed a desert. The word priceless might even come to mind, depending on the circumstances. I can also tell you what a gallon of gasoline is personally worth to me right this very minute. I would pay more than it currently costs. A gallon can get me to Costco and back. It's about 10 miles from my house. I'd really not want to do that on foot! We fell off the chart again. Since I had to change the chart to accommodate the seemingly relentless path of monetary policy, I also decided to add a new data series in purple. 1. 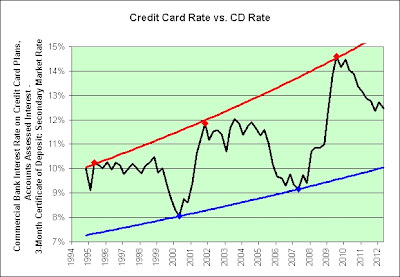 Blue represents pre-deflationary crisis. 2. 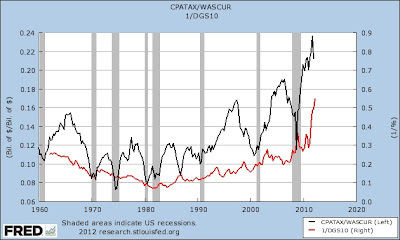 Red represents deflationary crisis. 3. Purple represents post-deflationary crisis. As seen in the purple trend line, there is actually more certainty now than before the housing bubble popped. We're sticking to that purple trend line like glue. 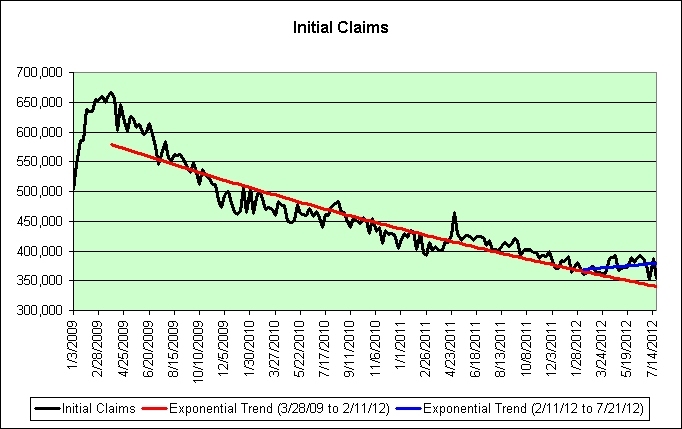 The turning point appears to be December 15, 2010. 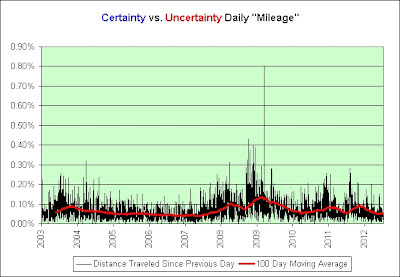 That starting date yields the highest correlation (0.95). Also note that the blue and purple trend lines are well-aligned. The daily movements in interest rates are also modest. From a volatility standpoint, there's just not much to see here. Those waiting for higher interest rates once this period of supposed uncertainty comes to an end may be severely disappointed. Where is the panic in these charts? Where is the fear? 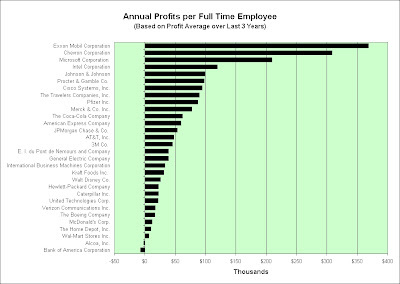 Instead, I think we're seeing a growing realization that the era of making money off of money has come to an end. To back my long-standing theory, it is "certainly" difficult to make money off of the current -0.59% 10-year TIPS. For what it is worth, I am having an extreme interest rate epiphany today. 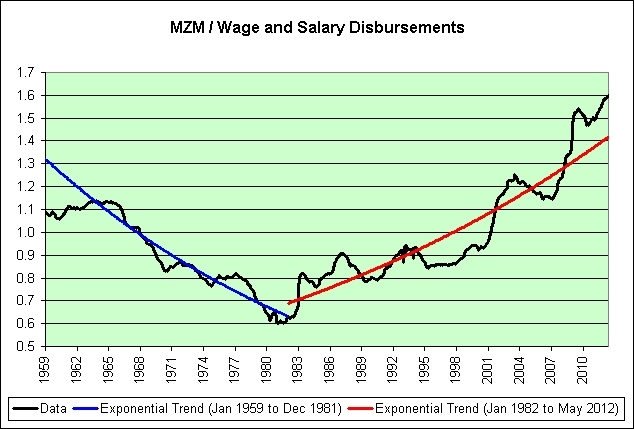 The following chart shows MZM divided by wage and salary disbursements. 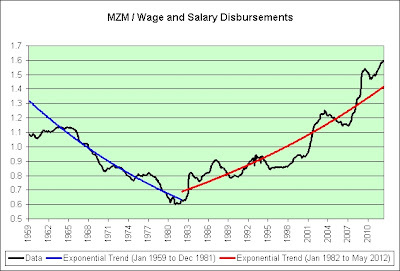 With all that MZM growth compared to wages you might think that interest rates are destined to rise. That seems to be the common knowledge belief. There's just one small problem with the theory. 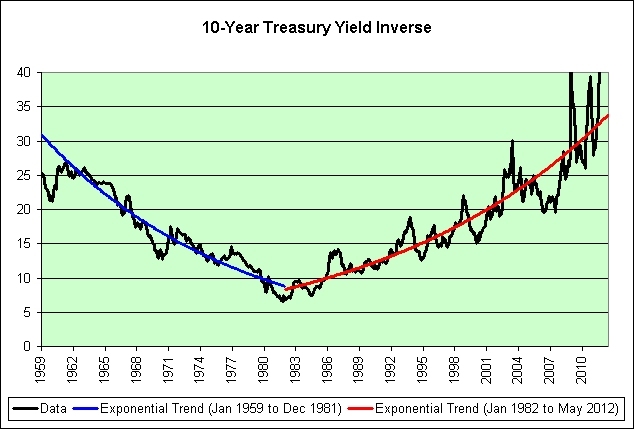 That chart's shape looks just like the inverse of the 10-year Treasury yield. Inverse! Note: I clipped off some of the most recent data points to both show more detail of the blue and red trend lines and more closely align them with their counterparts in the first chart. 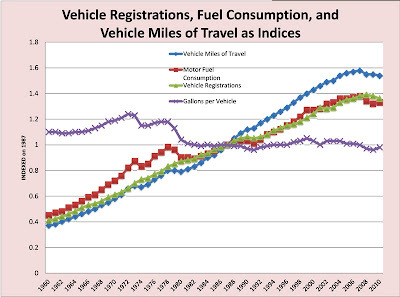 Now let's combine the two charts and test the correlation. 0.85! That's a very high correlation. Of course, we already knew that with a simple inspection of the first two charts. They look like identical twins separated at birth. 1. If one expects wages to continue to struggle over the long-term and MZM to continue to grow over the long-term, then one might expect interest rates to continue to fall over the long-term. 2. 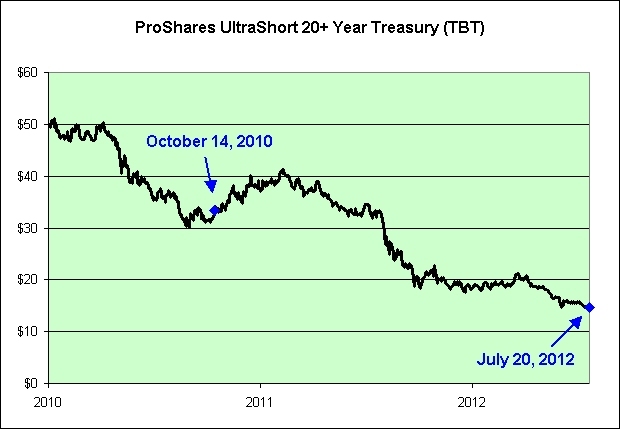 If this chart has any merit, then the 10-year Treasury is about 1% lower than it should be right now. That's hardly a bubble. See #1. Also factor in the European cluster####. Well, you know. Fill it in with a four-letter word of your choosing. I suggest "euro" but other words work as well. 3. 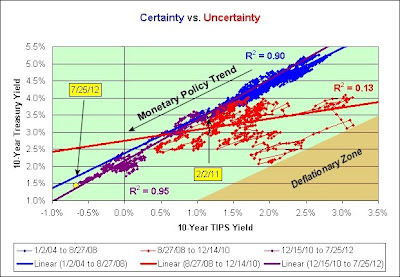 Hyperinflationists may continue to lose money shorting Treasuries and conspiracy theories will continue to grow in order to rationalize the losses. 4. Jeremy Siegel really should throw in the towel at some point. 5. They can pry the long-term TIPS from my cold dead fingers. 6. EE Savings Bonds still look good to me. 7. What's going to stop us from turning Japanese? 8. 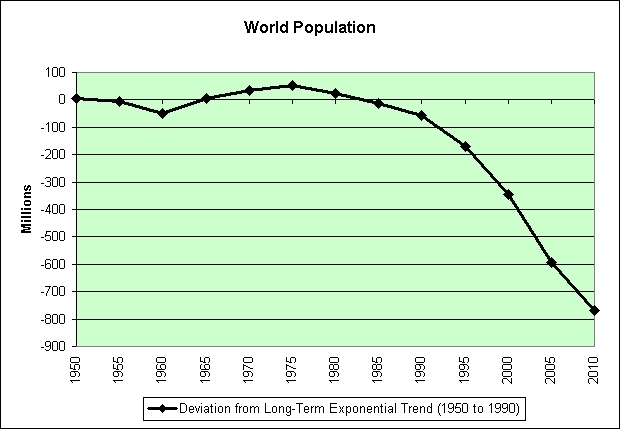 The exponential trend failure era is here to stay. 9. It will become harder and harder to make money off of money. This economy cannot support high real yields. These are just the anonymous opinions of a permabear. This is most certainly not investment advice. I offer another version of that last chart. This time I'm plotting the blue and red zones independently. 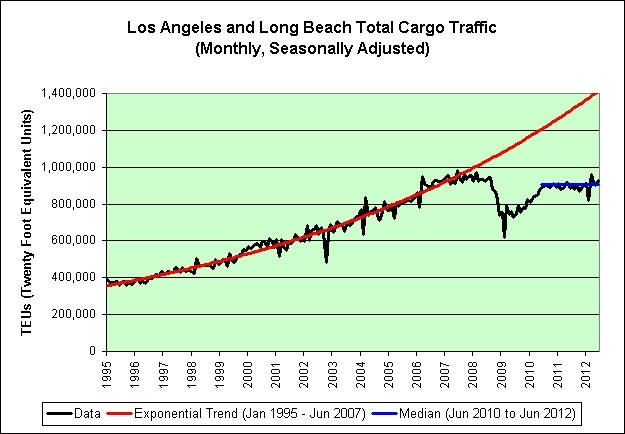 For all intents and purposes, the red and blue trend lines are one and the same. Epiphany! In my last post, I offered the following chart. 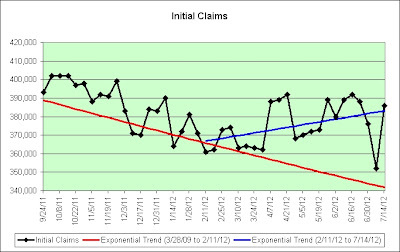 After giving this more thought, I think the following chart may be more appropriate. 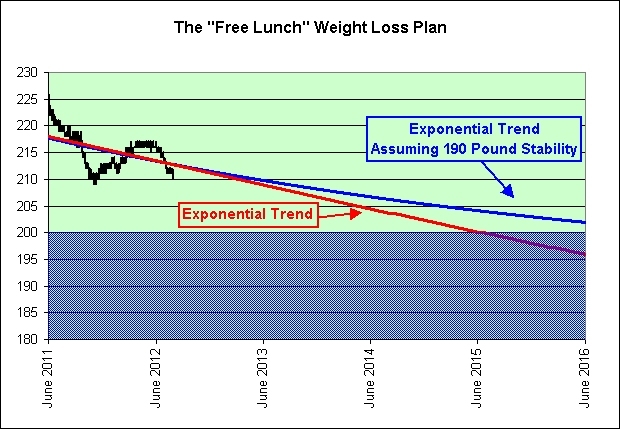 I offer two exponential trend lines based on the data points of the same color. 1. When times are relatively good (and most people can therefore pay their credit card bills in a timely fashion) the interest rate spread can be lower. 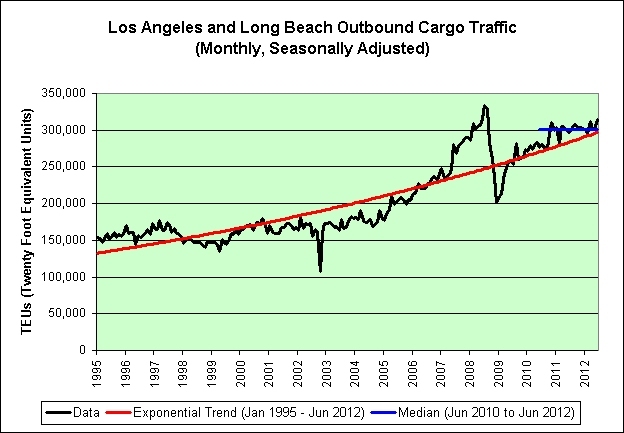 You can see this in the blue trend line. 2. 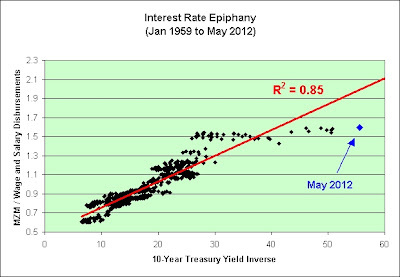 When times are relatively bad the interest rate spread must be higher. For example, if one out of ten people can't pay their credit card bills then the banks have to make up the difference on the other nine out of ten people. 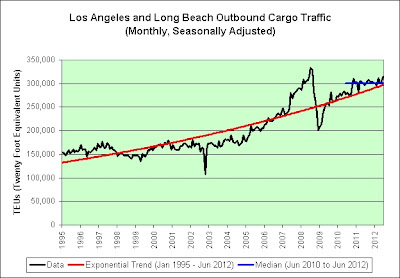 You can see this in the red trend line. 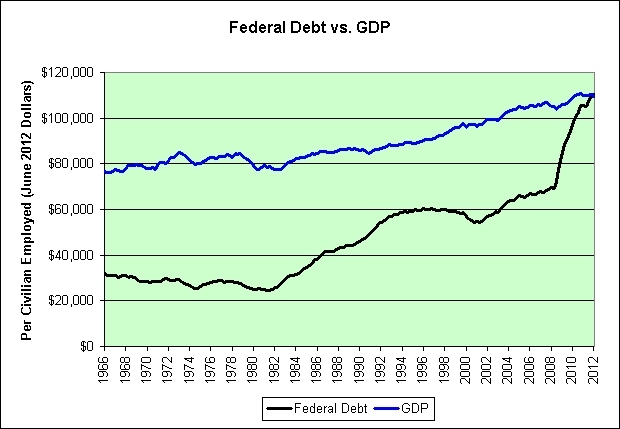 What do the overall long-term trends in the chart say about the health of our future economy? It's just an opinion, but I think I can sum it up in one word. 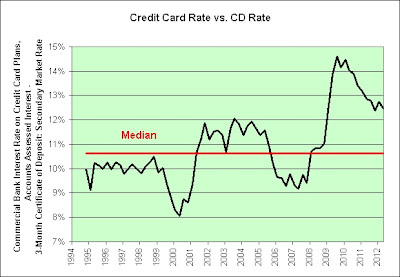 The following chart shows the difference between credit card rates on accounts that pay interest and the interest earned on 3 month certificates of deposit. 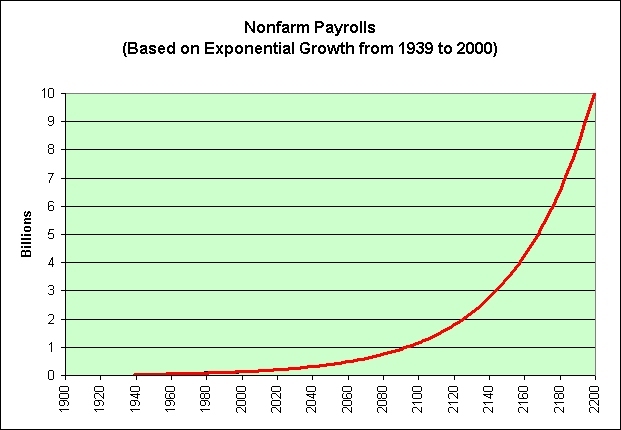 This is a legendary exponential trend failure. 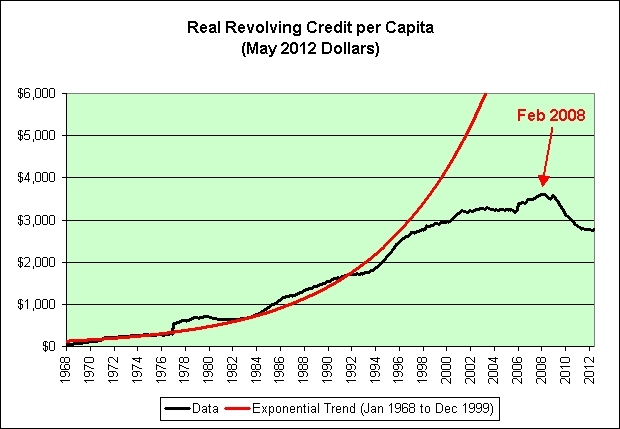 If the exponential trend that had been in place from 1968 through 1999 was still in place, the total would be a whopping $16,400 revolving debt per capita right now. Guess what? We're not going back to the trend line! 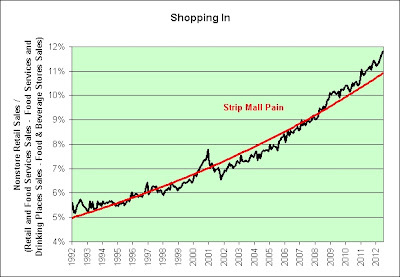 How many more epic exponential trend failures do we need to see before most people start to think that maybe, just maybe, it is different this time? I remain a permabear. Sigh.